There will be 24-hour police patrols at certain Islamic sites in London after two suspicious fires, the Metropolitan Police Commissioner has said. Fires were started at a community centre in Muswell Hill on Wednesday, and a Chislehurst school on Saturday. An increased police presence has now been put in place around potentially "vulnerable" locations, said Sir Bernard Hogan-Howe. He called on Londoners not to be divided by the death of Lee Rigby. "These are difficult times for London's communities," he said. "The Met is now investigating suspicious fires at two locations within the Islamic community which have happened in the past few days. Fortunately no one has been hurt, but we know that fires can often prove fatal." He said he wanted to reassure people that the police were "using our full range of policing tactics to protect sites that might be vulnerable". "In all boroughs across London, there is an increased police presence around locations that might be at risk. We will maintain a 24/7 guard of uniformed officers at sites we consider to be at greatest risk," he said. "We should not allow the murder of Lee Rigby to come between Londoners. The unified response we have seen to his death across all communities will triumph over those who seek to divide us." For the Met Commissioner to make a public statement in this way indicates the seriousness of the situation and reflects concerns about the effect on some of London's minority communities. Of particular significance is his announcement that there'll be a "24/7 guard of uniformed officers at sites we consider to be at greatest risk". This suggests the Met believes further attacks may follow. It will also entail a reallocation of resources and personnel - at least in the short term. BBC home affairs correspondent Danny Shaw said the commissioner's statement indicated the seriousness of the situation and reflected police concerns for some of London's minority communities. He added: "This suggests the Met believes further attacks may follow." 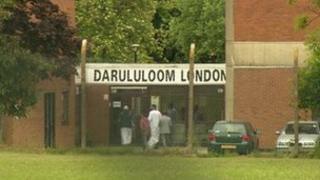 Almost 130 pupils and staff were evacuated from Darul Uloom boarding school, in Chislehurst in south-east London, on Saturday. Firefighters were called to the scene just before midnight. Two men were treated for the effects of breathing in smoke but no others were hurt, police said. School spokesperson Sayed Mahmood said intruders had been caught on the school's security cameras. "We are part of the British community and are deeply saddened by the events that have taken place last night," he said. He said the building had previously been targeted by vandals. "We urge the community to stay firm and united in bringing the people responsible to justice." On Wednesday, firefighters were called to the Al-Rahma Islamic Centre, a community centre which was mainly used by children after school, in Muswell Hill, in north London. The two-storey building caught fire in the early hours of the morning and was brought under control in just over an hour. Following the fire, police said, the letters "EDL" (English Defence League) were found sprayed on the side of the building. The blaze prompted local Muslim groups to call for the authorities to take "serious action" over anti-Islam attacks. The fire was the latest in a number of incidents across England in which the Muslim community has been targeted. Drummer Rigby was killed as he walked back to his Woolwich barracks in south-east London on 22 May. His family called for calm in the wake of his death, saying in a statement that his friends' different cultures and religions "made no difference to Lee".